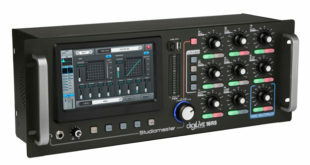 digiLiVE 16RS and 16P-600 will be on show, alongside an updated version of the LIVESYS5 micro PA/powered monitor system. Manufacturer has debuted its digiLIVE16R "blackbox" micro-mixer and new TOWER column-array system in Frankfurt this week. Additions include new active DRIVE PA cabinets, the digiLiVE 16 micro-mixer and more CLUB XS analogue desk models. Measuring just 290 x 210 x 175mm and weighing in at 3.3kg, the system can also be used as a stage monitor. Firm identifies lines such as DRIVE, Venture, ClubXS and LIVESYS5 as integral to its strong sales performance in the last few months. Company will also show off the new VISION series, DRIVE PA cabinets and ClubXS portable mixers.